To win, you must have a Differentiating Competitive Advantage. 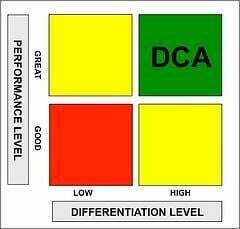 Every corporate strategy textbook espouses the importance of creating a competitive differentiation. So, why do so many companies struggle? We believe that the competitive differentiation frameworks in textbooks are too theoretical and complex. To address this problem, SHIFTPOINTS developed a simple 2x2 matrix to illustrate how companies can create a competitive differentiation. We have lots of competitors, but we are the Only One that _________________. If you can't easily answer those simple questions, the SHIFTPOINTS WINventory tool can accelerate the process. Every company has a strategy. But most are diffused and reactionary. Many entrepreneurial companies are consumed with tactics. If they even have a strategy, it could be summarized as “more.” More markets, more proposals, more products, more cities, etc. The problem is that sometimes, more is less. Others pursue a haphazard mix of tactics. An acquisition here. A new market over there. A couple of new products for good measure. Others just try harder. They work longer hours and make more calls. They set higher quotas and demand better results. Most of the time, they create a short-term flurry of activity, but not real, sustainable, and profitable growth. As a result, only 1 in 1000 companies grows from $1M to 100M in revenues (source: Winning Performance). In contrast, high-performance companies are more systematic and disciplined about their strategy. They are intensely focused, and would rather dominate one market than dabble in a dozen of them. Wal-Mart and Kmart started at about the same time. Wal-Mart stayed intensely focused on the discount retail segment, systematically reducing costs and passing the savings along to customers. Kmart dabbled with sporting goods stores (acquiring The Sports Authority), bookstores (acquiring Borders), office products (acquiring OfficeMax), and more. It is clear who had the winning strategy. Developing strategy is about making choices. Winners don’t target every customer segment; they pick the best ones. Winners don’t develop every product; they develop market-defining category killers. Winners don’t chase every deal; only the most profitable ones. In addition, high-performers have the discipline to exit unprofitable markets, prune undifferentiated products, and eliminate underperforming people. This discipline allows them to aggressively invest in the best. Finally strategy is also about alignment. The product strategy is aligned with the pricing strategy. The marketing strategy is aligned with the sales strategy. The delivery strategy is aligned with the customer’s expectations. And everything is aligned with the company’s One Thing. So, is your company dominating or dabbling? If you need to improve focus, the SHIFTPOINTS Design One Strategy process can help. The best way to start is with The Pit Stop Program.